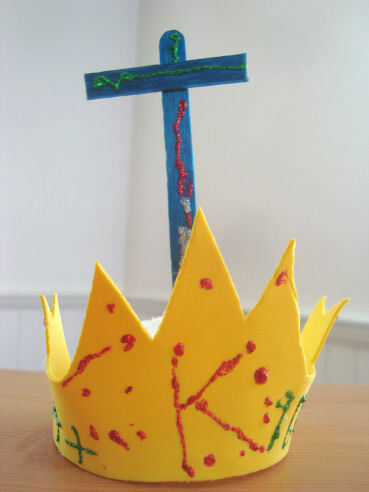 I knew I wanted to make “K” week about Jesus being king, but coming upwith a craft was harder than I thought it would be! 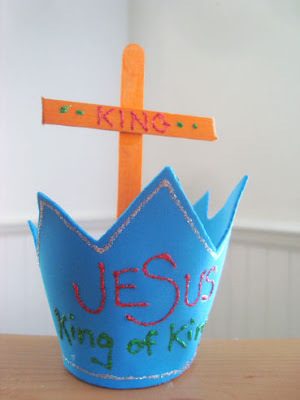 I wanted it to be aclearly religious king craft. 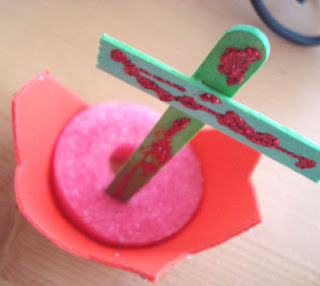 There are already so many secular kingcrafts out there, so there’s no need to waist my time re-creating thewheel, are you with me? Lol! 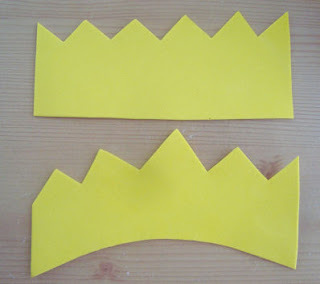 Start by cutting the foam or paper into a crown shape. You can cut a regular, flat crown shape, but if you curve the shape a little the crown will have a cuter shape when the craft is complete. Older kids should be able to do their own cutting. 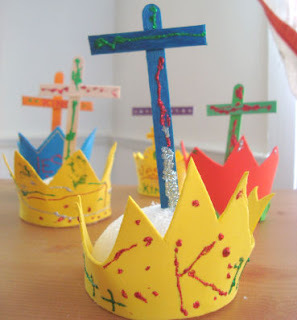 Let the kids decorate the crowns however they like. I lightly drew a “K” on my daughter’s crown and let her trace over it with glitter glue. 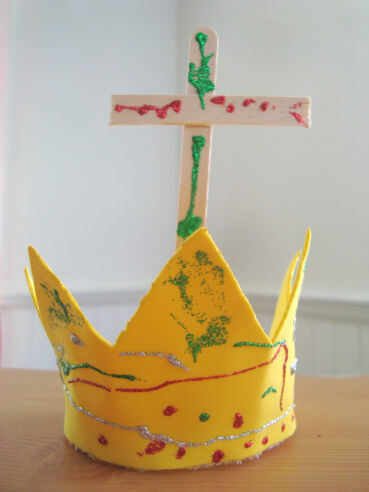 She did a pretty good job! 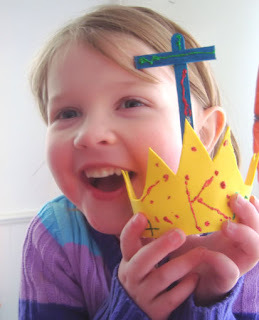 Mostly I let her free style it because she loves to be creative! 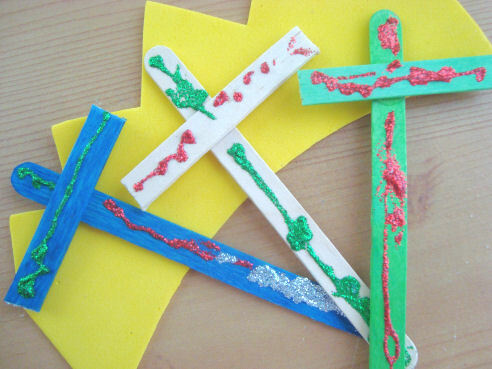 You need 2 popsicle sticks to make the cross. 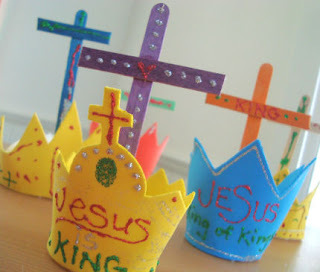 Shorten one of them with some scissors, and let the kids glue them together and decorate the crosses as well. 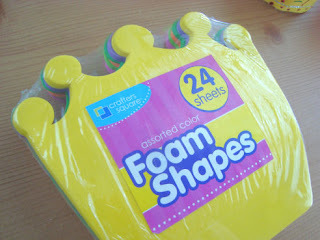 When your decorations dry, it’s time to put it all together! 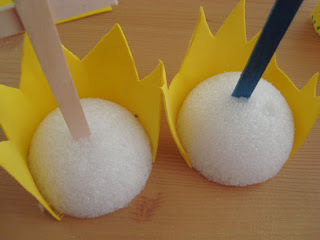 Carefully saw a styrofoam ball in half with a sharp kitchen knife. Use your cool glue gun to attach the foam around the base of the ball. Then your kids can stick their cross in the middle of the crown! Thanks to everyone on Catholic Icing’s facebook wall who bounced ideas with me about how to make these crosses stand up! You guys are a great crowd and I love talking to all of you! 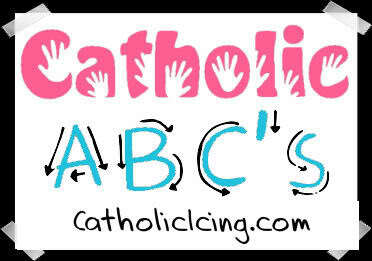 Catholic ABC’s runs here at Catholic Icing every Wednesday with the newletter of the week. You can get the details of this program by checkingout the Classroom Script. 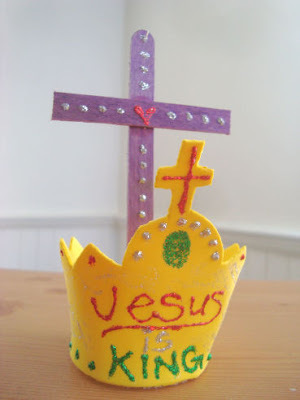 I’m very pleased with the results of this craft, and Lydia (my 4 year old) absolutely loved it! you all did a great job on this craft. they are beautiful! and your scripts are unbelievable! 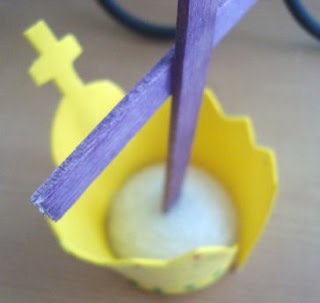 thanks for sharing your incredible creativity Lacy!